In her first collection of stories and pieces, Harriet Doerr explores the magical power of memory and brings us a wealth of unforgettable characters: eccentric eighty-two-year-old Great-Aunt Alice, who, empowered by a lucid memory, lived out her final, physically debilitated years with grace; Edie, who arrives in California from England to bring sanity and peace to a house with five half-orphaned children and a despairing widower; Paco, eight years old, and Gloria, eleven, children caught between the longing and pleasures of childhood and the harsh mature realities of their meager circumstances in a Mexican village. These and other characters are captured in the web of life with a startling sensitivity that will touch the reader at every turn. 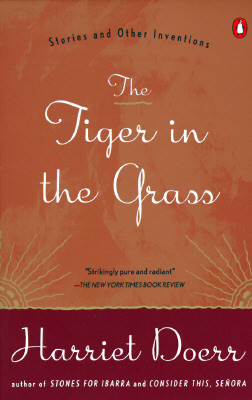 Harriet Doerr (1910-2002) was the author of Tiger in the Grass, Consider This, Senora, and Stones for Ibarra, which received the American Book Award for First Work of Fiction, and was translated into ten languages and published in twelve countries abroad. She received her BA from Stanford in 1977, and then continued in the Creative Writing Program, where she was named a Stegner Fellow.